GB Judo took home two medals from the 2018 Antalya IBSA Judo Grand Prix following Sam Ingram’s silver and Elliot Stewart’s bronze on Monday 23 April. The Grand Prix in Turkey was the second global world-ranking event of the Tokyo 2020 cycle and the two-day competition (Sunday 22 and Monday 23 April) saw a world-class entry at every weight including current Paralympic and World champions. With Tokyo 2020 qualification starting later this year, this event was an opportunity to secure a good seeding at the World Championships in Portugal. Two-time Paralympic medallist Sam Ingram had moved up to -100kg following Rio 2016 and made a strong impression at that weight with gold at the Tashkent World Cup last October. He started his day with a solid win over American Ricky Ties as two waza-ari’s in quick succession saw him move into the quarter-finals. Ukraine’s Oleksandr Pominov was next up and after a fast-paced and even start it was Ingram who took the win as he spotted an opportunity in newaza and held down his opponent for ippon. His semi-final opponent Sharif Shalilov (UZB) was a former Paralympic silver medallist from London 2012. However, the Uzbek judoka had moved up a few weight categories since then and Ingram used his strength and weight advantage to good effect. The British judoka took a waza-ari lead in the opening exchange with a nice tomoe-nage and controlled proceedings from there as he forced Shalilov to pick up two shidos for breaking off his grip. The Uzbek fighter pressed Ingram hard but the British judoka showed good tactical nous to make it through to the final. Georgia’s Zviad Gogotchuri had won -90kg Gold at the Rio 2016 Paralympic Games and like Ingram had moved up a weight since. The Georgian had won both times these two had fought during the Rio cycle and it proved to be a close and physical contest. Ingram did a good job of leading the gripping exchanges which meant that Gogotchuri struggled to pull off his big attacks and resulted in two shidos for the Georgian. Going into the final minute Ingram picked up a shido as well for a false attack but was still keeping Gogotchuri at bay. However, with just 30 seconds to go the Georgian was finally able to pull a big throw and took the lead by waza-ari. That score proved decisive and left Ingram with a hard-fought but well-deserved silver. Birmingham judoka Elliot Stewart had only made his VI Judo debut at last year’s IBSA European Championships in Walsall, where he finished fifth. Stewart had backed that up with bronze at the Tashkent World Cup last October. The British fighter took on Uzbekistan’s Boykulov in his first contest of the day following a bye into the round of 16. Stewart was too good for his opponent as he threw The Uzbek for waza-ari with a nice uchi-mata before finishing the contest not long after with another nice throw. Russia’s Vladimir Fedin had beaten Stewart at the Tashkent World Cup and the British judoka showed his improvement as he tactically out fought the London 2012 silver medallist. Stewart’s superior gripping forced Fedin into picking up three shidos for a mix of breaking the grip and false attacks. That win took him through to the semi-finals where he faced Ukraine’s Aleksandr Nazarenko. The Rio 2016 silver medallist had beaten Stewart on his debut at IBSA Europeans last summer so this contest would be a good marker of the British judoka’s progress. 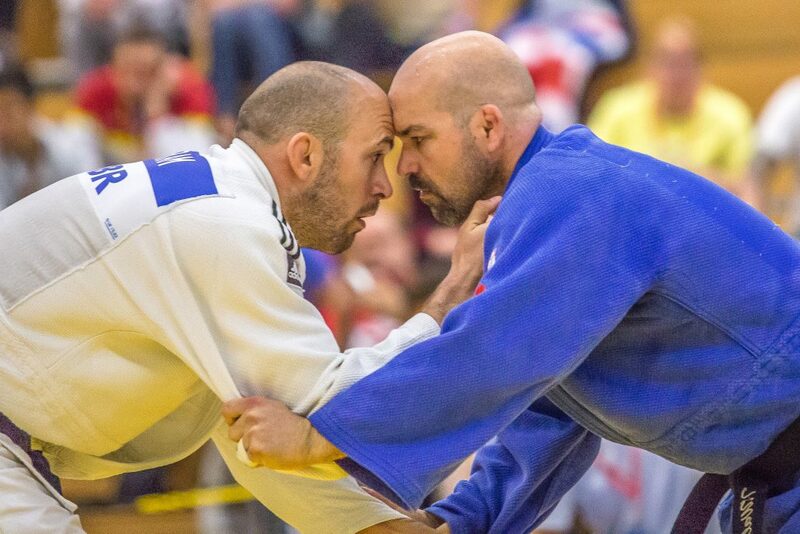 In a high-quality fight, neither man could gain a real advantage with both judoka picking up two shidos in normal time. In golden score Nazarenko’s strength and experience forced Stewart into a rushed attack which the Ukrainian countered for ippon. Stewart dropped into the bronze medal contest where he faced current IBSA European champion Rovshan Safarov (AZE). The Azerbaijani judoka is an explosive fighter but Stewart put in a superb tactical performance as weathered the early attacks from his opponent and took control of the contest. Stewart’s gripping once again forced his opponent into errors as Safarov picked up two shidos to one by the British fighter. With just over twenty seconds left Stewart countered an attempted attack by Safarov with nice te-waza to take a waza-ari lead which he held onto with ease. There were also fifth place finishes for Natalie Greenhough (-70kg) and Jack Hodgson (+100kg). Greenhough showed good determination in her quarter-final against Angelique Quessandier (FRA). The French judoka had taken a waza-ari lead in the final minute but Greenhough forced her opponent into negative attacks which resulted into two shidos for Quessandier. These shidos were in addition to an earlier penalty and meant that Greenhough took the win. The Crawley judoka gave a good account of herself in the semi-final against Olga Zabrodskaya (RUS) before the Russian applied the arm lock and forced Greenhough to tap. In her bronze fight Greenhough was thrown for ippon by home judoka Raziye Ulucam (TUR) with just over a minute gone on the clock to finish just outside the medals. Hodgson made a strong start as a he beat An (KOR) and Hayran (TUR) by ippon to move through to the semi-finals against Shirin Sharipov (UZB). The Uzbek judoka was too good on the day as he applied a strangle on Hodgson and forced the British judoka to tap. The bronze medal contest against Iran’s Mohammadreza Kheirollahzadeh (IRI) followed a similar pattern. The Iranian showing his class on the ground with a determined strangle to leave Hodgson just outside the medal rostrum. Chris Skelley (-100kg) was unplaced as he lost out to Gogotchuri (GEO) with the Georgian throwing the British judoka for ippon. The Hull fighter had a chance to come through the repechage and made short work of UAE’s Alali before losing out to Russia’s Abdula Kuramagomedov in the second repechage round.